A special holiday post a few hours early today. Down on Baltimore Street, in the front yard of the sprawling complex that calls itself the "Farnsworth House," a tombstone used to sit. It was greyish-white, tall and arched at the top. In front of the marker, the dirt sat freshly turned, a single rose marking the grave. On the stone's face was the motif of a cherub. And under the wings were inscribed, "In Memory of Benajah Edwards who Departed this Life July 2 1863." Below, as a sort of epitaph, read the words, "Ghost Story Tickets in Bookstore." The plywood of the mock-grave eventually weathered and was removed. The Bookstore closed to make way for a seance parlour, another cashgrab expansion to enlarge what (mocking Lincoln's immortal words) the proprietors call "Gettysburg's Haunted Address." My favorite holiday is Halloween. When I was growing up, it meant so many things. First, it meant the chance to wear odd and wonderful costumes to school. Mummies, vampires, ghosts, Frankenstein's monster. Second, it meant the joyous time of sparkling snow was arriving. No matter what the weeks before had been like, Halloween was a guaranteed snowfall in Upstate New York. It was like clockwork. As I grew older, the fantasy of Halloween took strong hold of who I am. I found Tim Burton. I found the Nightmare Before Christmas and Disney's Haunted Mansion. I found ways to stretch that morbid but jocular holiday out longer and longer. One year in High School, in the week leading up to Christmas break I dressed up each day as the litany of characters from Dickens' Christmas Carol, sporting a top hat for a miserly scrooge, a lighted candle atop my head for the Ghost of Christmas Past and rattling (plastic) chains through the halls as Jacob Marley. I love the morbid and the dark. I love the twisted fantasy world of Halloween. Halloween is the holiday of the wry smile, more so than any other. We walk into a haunted house ready to meet "ghosts" and "zombies" who are really just local kids looking for some pocket money in a part time job. The Hitchhiking Ghosts that Disney conjures are metal armatures, pneumatic cams and rubber masks. They make us smile and laugh and scream, but we know what's underneath it all. Halloween is a fiction we all pretend is real for a moment for a good time. I haven't felt too "Halloween" in the past half-decade or so. That warm feeling and my love of the holiday has receded. Most of that I think I can attribute to living to Gettysburg. This community now so often uses the names, faces and experiences of the dead as a cruel joke that the novelty of the Halloween spirit now chafes. No place in America has the morbid become the jocund so universally than in Gettysburg. I've spoken a bit about why this might be and what we can learn from it in the past. But the reason and the lesson don't change the raw feeling that the product produces in my soul. That fake tombstone in front of the Farnsworth House really set off a bomb in my consciousness. And now, even though the piece of garbage has been removed from the front lawn, the scar still remains on my heart every single time I walk past the Farnsworth House. Benajah Edwards didn't exist. But plenty of other men did. My Great-great Grand Uncle died at Gettysburg on July 2nd and has no grave. Every time I think of that tombstone, I think of him and the others whose names and resting places have been lost to all eternity. You can conjure them far more easily than the charlatans down on Steinweir Avenue ever dreamt. Just list the contents of their pockets. Before being lovingly placed in the ground of the Soldiers' National Cemetery, the pockets of the dead were emptied. 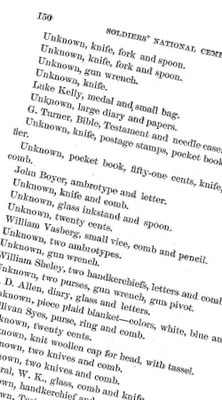 Some of the trinkets held clues to the identities of the men. Some yielded nothing more than silence. The contents were catalogued and kept, according to the 1867 report on the cemetery, "in the possession of the Cemetery Association at Gettysburg, Penn'a." Where those carefully guarded momentos are now, I have never been able to track down. Their whereabouts have disappeared just like the names of many of their original owners. Still, the tantalizing list remains. 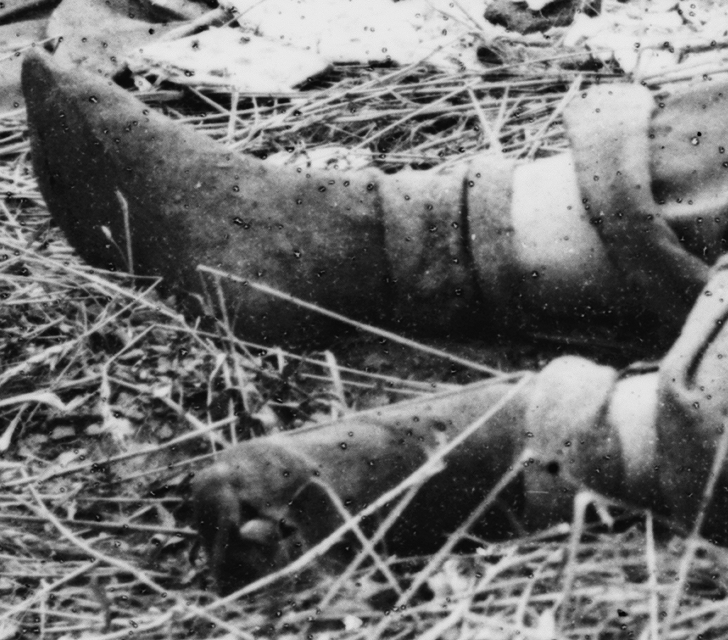 One unknown soldier, whose name disappeared when a bullet or piece of shell drove itself coldly into his body, was wearing two rings and carried a small book cut of wood. Another carried a spoon and a glass inkstand, no more letters arriving at home penned with it's dark contents. A soldier was lain unknown in the cold ground at Gettysburg, the only clue to his identity a testament, written in German and inscribed to him from Catherine Detaupafer. Another held in his pocket a letter from Carrisa Smith. Would Catherine or Carrisa ever learn the fate of the two men? A young man lay dead on these fields nearly 150 years ago. In his pocket sat an ambrotype of a young woman and a letter. He was real. He was not a fantasy. When that young woman cried, the tears were real. When he bled, the blood was real. It wasn't plywood. It wasn't a joke. 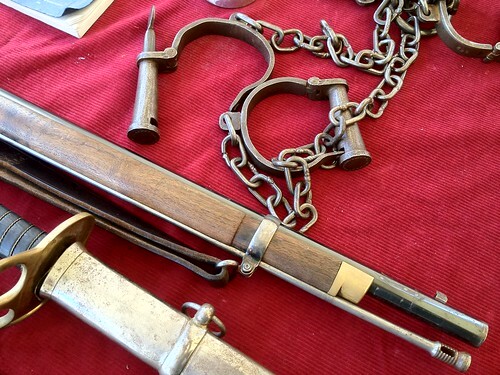 Broken chains and muskets: the very essence of the slaveholder's rebellion. The war was caused by a blind, stalwart defense of slavery. The war hinged upon the future of slavery in America. The war shattered slavery in the United States forever. 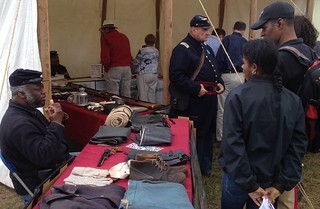 Thanks to the 3rd United States Colored Troops reenacting unit for their excellent impromptu exhibit at Gettysburg College last month (where this photo was taken) as part of the celebration of the Emancipation Proclamation. If you missed Pennsylvania's Civil War Roadshow in it's final stops before being dismantled, you missed out on excellence. The exhibit explicitly dealt with causes, meanings and race in meaningful detail and to great extent. The touring exhibit will be installed in the Pennsylvania State Museum to, "allow a greater number of people to see and enjoy this important exhibit." Because everyone knows things without wheels reach far more people than things with wheels. I went on a tour a few Sundays ago. It was very tough to explain exactly what I had done (in sensible terms) with my coworkers when I came into the office the next Monday morning. Not just very tough, but embarrassingly tough. THEM: "What did you do this weekend, John?" ME: "Well, Sunday I went on a tour of places on the Gettysburg battlefield where one specific photo wasn't taken-"
where the photos were not taken. That conversation really tends to go nowhere, frankly. 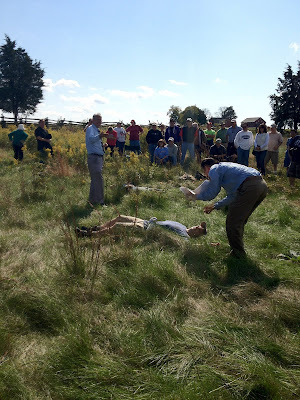 Tim Smith and Garry Adelman toted around 60 eager visitors as we patrolled the battlefield at Gettysburg, visiting the places that aren't where the Harvest of Death series of photographs, Alexander Gardner's enduring battlefield mystery, could have been taken. We crossed the Sherfy Farm to set foot in Mr. Spangler's fields. We stood just north of the Wentz House and squinted at Little Round Top. We wandered around behind the former Keefauver Elementary site and ended in a driving rainstorm along Reynolds' First Corp Line. And throughout the day, at stop after stop, Garry and Tim unfolded for us why the Harvest of Death could not have been taken at that place. Much time, hot-air and many electrons have been expended on this topic of late, spurred on by a few publicly expressed theories (many of which end up being rehashes of long discounted theories). Particularly, John Cummings over at Spotsylvania Civil War Bloghas been hammering relentlessly on his theory. In turn, Garry has been urging caution in publicizing new theories before they've been vetted and the author him or herself has vehemently tried to prove themselves wrong. I spent 5 hours out on the field on Sunday, in a quest to learn about a landscape to better find a photo's true location. But in the end, it doesn't matter at all. I'll repeat that and emphasize it: the actual location of the Harvest of Death and the other photos taken nearby does not matter at all. He had eyes and a nose. It might be nice to know. Garry expressed as much during the tour. He said he'd like to lie down where the men lay, in the exact spot. He wants to be able to feel the real. I understand that sentiment. It's part of the reason we preserve these places. We want to touch the proverbial pieces of the true cross. But in a larger sense, finding the site means nothing. The men are gone. The bodies have long since rotted. Either they were moved to the Soldier's National Cemetery when the bulk of the Federal dead were reburied in the winter of 1863-64, or they rest in an undiscovered and likely never to be found grave somewhere in the Pennsylvania topsoil. The burial crew has found their own home in the earth as well. Finding the site will yield no evidence of what happened there. It will be a sterile farm field among other sterile farm fields. It is not a tangible reminder of anything in particular. The pictures themselves hold the true power. Zoom in on that photo. Zoom in really close. Download the TIFF version and hold onto your seat as you dive into the world of 1863. It's the wonder of the Library of Congress' massive scans of these images that makes them into true windows into the past. The only thing matters is that moment, frozen in time forever by mercury or albumen. It doesn't matter where exactly that photo was taken. In fact, the photo draws some of its power from the very fact we don't know where it was taken. First, it means that the photo still holds sway in the imagination. It isn't simply a dopey scene to reenact for your Mom's camera as you jump from rock to rock in Devil's Den, only to rise up from the morbid spot and go back to the hotel room and watch a re-run of Law and Order before nodding off to sleep. Tourists lay down and pose, then do something these soldiers never could: they go home. And how many of them are reminded of that fact, as they hop back into the comfy, air-conditioned car? When we find the spot, it might simply become a carnival sideshow. While it's a mystery, there is still reverence. This could be my Grand-Uncle. Or your Grandfather. Or anyone's. The mystery also lends raw power to the men within the photo. When we know the place, we can begin to discern who the men actually were. We can make stabs at their regiment;, we can speculate as to which men from which company might be that bearded face or this clenched fist. As long as the photo remains a mystery, the men captured in time are simultaneously no one and anyone. These handful of men stand in as visual reminders, the once-living sculptures who can be any young man who bled and died on these fields. They are an embodiment not of one man, but of every Federal soldier on the field at Gettysburg. 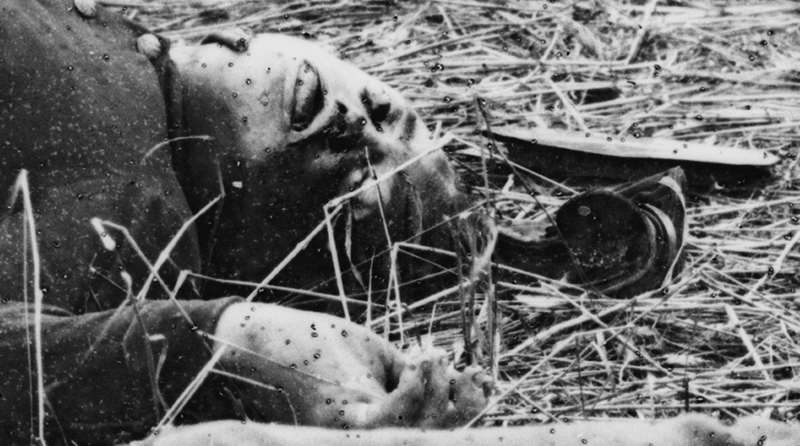 Take away that universality, give them names and ranks and regiments, and they lose their deeper meaning and power as stand-ins for every dead United States soldier. Where the photo was taken doesn't matter. But I guarantee that we'll keep spilling gallons of ink (both real and digital) over the matter for years to come. I have my own theory of where the photo is. I'm not going to say where. I haven't done nearly enough research or meditation to come out an say. It's irresponsible. I'm not going to say where I think Gardner's Harvest of Death series was captured. In fact, if I discovered with 100% accuracy where that photo was taken, with all the surety available on this earth, I'm still not sure I would say where it was. I might hide the truth from the world and never tell another soul (beyond maybe Garry and Tim, after having sworn them to secrecy). I hope we never find that place. Because when that happens the photo may very well cease to matter. It will simply become a means to an end. It will be the treasure map to a giant red 'X' on the ground, discarded as soon as the shovels (or in this case modern cameras) are whipped out. While the location is still a mystery, people still stare into those cold, lifeless, sorrowful and twisted faces. And that's the only reason the photos hold any meaning. They're the only reason it matters at all. Like a prose poem, the passage leaped off of the page of the Lutheran and Missionary as I scanned the newspaper's columns. Sitting in the reading room of the Abdel Ross Wentz Library at the Lutheran Theological Seminary, my heart raced. It's not often that you find new words penned by someone you've been studying for years. 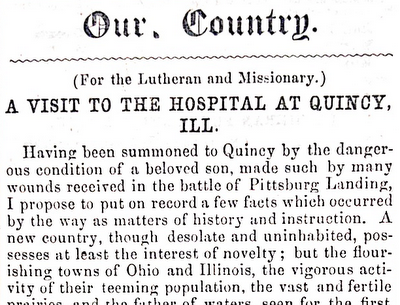 Under the headline, "Hospital Experience," in the September 25th, 1862 edition of the newspaper, a simple column of text speaks to a harrowing and sorrowful experience in a federal hospital. Just days after the bloodshed and destruction of the Battle of Sharpsburg, the caring hearts of Pennsylvanian Lutherans were yearning for some glimpse into the reality of war that had lapped at the shores of the Commonwealth and crashed in a devastating cascade along the mountains to the south. The article is signed, "H. L. B.," almost certainly Pennsylvania College President Henry Louis Baugher. 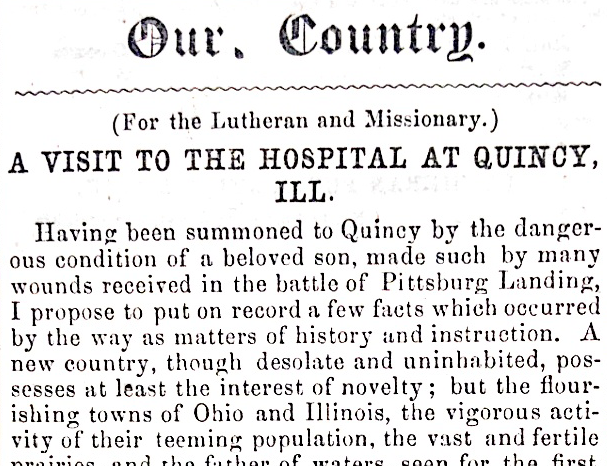 The last (that I've found) in a series of short articles about Baugher's experience in a Federal hospital in Quincy, Illinois, the article is the most touching of the lot. Tragedy had drawn the Pennsylvania minister to the West. 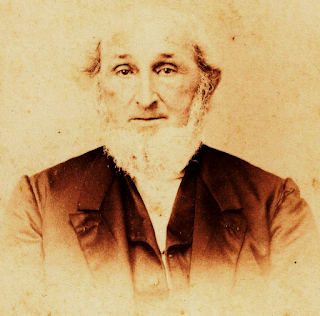 The President's son Nesbitt Baugher, lawyer and newspaper editor, lay in grave condition in a hospital bed in Quincy in the spring of 1862, bloody and gored by bullet wound after bullet wound at the Battle of Shiloh. Nesbitt began his struggle full of vigor and headstrong from the success of the armies in the battle, writing from his bed to his father that he had, "news for you – great, glorious news for our country, but not quite so for me." A young man, full of animal vigor, and animated by lofty patriotism, is wounded, it may be once, twice, or oftener. The pain of the wounds is not very great; he is carried to the hospital; under the influence of chloroform his system is prepared for a comparatively painless probing and dressing. He is able to write home to loved ones, that he was wounded and is doing well, and that his is not seriously ill. In a few days fever sets in, slow but certain. There is nothing to alarm. Symptoms encouraging; wounds healing; physicians say the patient will get well. Still the slow fever continues. Unexpectedly there is a chill, then delirium; the soldier is once more in the battle field, and it is his last. Nature, enfeebled by disease, is no longer able to resist, and death approaches and obtains an easy victory. If you ask the physician what was the immediate cause of death, he will probably say that the puss discharged from the wounds thus vitiated and carried to the brain caused delirium and was unable longer to sustain life. There is true pain in the words of a father who has lost his own. You can easily conjure forth the form of a father, bending by his son's bedside as he thrashes in a delirious haze, watching as, "death approaches and obtains an easy victory." A few beds down the ward, another soldier lies prone, his, "head has been opened by a fragment of a shell, and the brain forced itself out of the opening." Drifting in through the door are the excruciating screams from yet another man, "the piercing exclamation repeated again and again," Baugher calls it, of the words, "Oh! God, be merciful!" 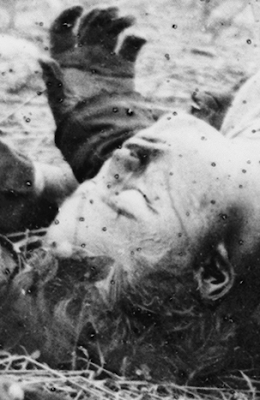 You can see President Baugher's face, stained with briny streaks. "Kind nature," he mused, "opens the fountain of tears that the breaking heart may find relief through this opened channel." And you can hear a father's plaintive voice, asking the question of why his boy had to die, and the surgeon's coarse and clinical reply: "the puss discharged from the wounds thus vitiated and carried to the brain caused delirium and was unable longer to sustain life." War becomes real. Painfully real. Sanctuary (noun). 1. A place of safety, refuge or protection. 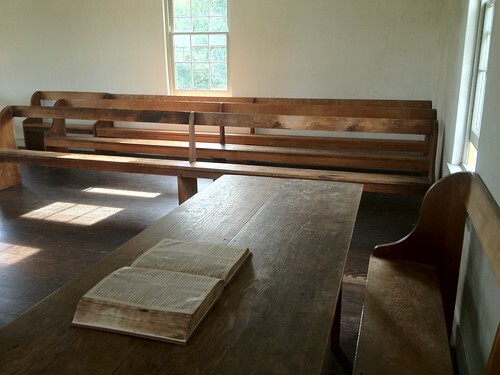 A few weeks ago, I spent an amazing weekend interpreting the Dunker Church. Not many of you were able to visit that amazing place on that amazing weekend. For those of you out there who didn't get to see my talks that weekend, or for those of you who would like to live them again, check out this MP3 recording of the presentation, with added music and sound.